Kathy S. from Beaverton, OR signed. James P. from Lake Zurich, IL signed. William W. from Chula Vista, CA signed. Hillary Clinton and Barack Obama are guilty of Murder! They disregarded Ambassador Stevens request for additional security. Mrs. Clinton, in her e-mails to family and Egyptian President acknowledged this was a pre planned attack and nothing to do with video. Point being "pre Planned" means she and POTUS knew about attack in advance. Mr. Stevens request for additional security had to be discussed in briefings with Obama especially weeks before reelection vote. They both lied and covered up to insulate Obama from his bid to be reelected. Had the truth been told Mitt Romney would now be POTUS. Senator McCarthy is a bonehead for his comments. Had he not said what he did possibly the democrats wouldn't oppose this. But as we speak, Hillary is getting away with murder and even worse, seems to be a step closer to becoming POTUS. For the sake of the victims families and the American people the truth must be told! If we can afford to train Syrian insurgents for $500 million than we can spend the funds to support this committee's investigation!! Someone from Kalama, WA signed. Someone from Lawndale, CA signed. Someone from Menomonie, WI signed. Eric W. from Centerburg, OH signed. It is important _always to tell the truth, the whole truth, and nothing but the truth. I demand action on the behalf of the American people, and criminal charges against any official involved in misleading, and covering up the truth..
Larry and Diana A. from Millbury, OH signed. Rudolph K. from Venice, FL signed. Richard B. from New York, NY signed. Someone from West Palm Beach, FL signed. Obama, Clinton & the rest of the people who sat there & watched the slaughter of our, men defending our Embassy and the people in it should be held accountable! If their family were in there they would have NOT sat by! Bonnie E. from Spokane, WA signed. Gary E. from Spokane, WA signed. These four guys that died didn't have to. I believe Obama is at the head of this, he didn't want to destroy his motto, Osama bin Laden's dead and AlQuida's is on the run. He wanted to tell a different story, and told his cabinet to repeat a different story,, all the while leaving special forces guys and the ambassador to die for nothing!!! 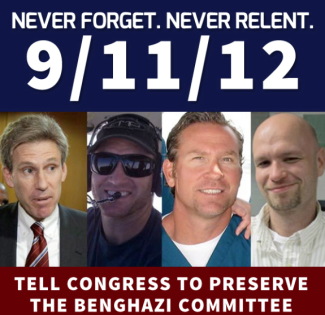 We, the people, have a right to know the truth regarding the Benghazi attack on our cultural affairs office. Sharon L. from Acworth, GA signed. She broke the law. it's time to press charges. In time of war, and that is now; individuals responsible for acts committed by reason of evasion or by omission and which causes harm to our Nation's Security is considered as Treason. Treason is serious and those responsible should be punished. As Ms Clinton and her minions should be held accountable for the deaths of our Ambassador and the Brave Americans who came to his aid. Until those responsible for those deaths and held up or delayed assistance come forward and stand accountable, when they will be held accountable by a Higher Authority. Robert P. from Kirtland, NM signed. JAIL FOR CLINTON AND OBAMA. IT IS NOT LIKE I AM ASKING FOR THE DEATH PENALTY, WHICH IS WHAT THOSE THAT TRUSTED THEM ENDED UP WITH!. Sandy P. from Newton, NH signed. Micheal R. from Julesburg, CO signed. Doris J. from Oakwood, GA signed. Douglas E. from Ashtabula, OH signed. Someone from Mableton, GA signed. Courtney D. from Virginia Beach, VA signed. Timothy C. from Benton, KY signed. We need to get to the ottom of this! Charles C. from Little Falls, NJ signed.